Well folks, the servers are down. It always happens. I happen to have a nice quiet Tuesday morning to myself and the server's are down. Seriously, Blizzard manages to plan ahead just for me. I know it. I figured I might as well make a post here. I've been slacking. This summer has been amazingly and wonderfully busy. New horse, big garden, lots of time at the lake and the river, two raid groups, numerous 90's, and so on. Well fall has started, school is in session and I don't know what on earth I'll be doing once the cold weather hits! Oh wait...play WoW? I'm not an addict, I'm not an addict! I've been working on a post that focuses on the Conqueror's set. I consider this set to be one of the most versatile plate sets in the game. You can use its pieces as mix-n-match fill-ins for many different sets or as a stand alone, it's easy to farm and it's usually reasonably priced on the auction house. Usually. I love it. I currently have all three plate wearers (sans DK) sporting variations of this set. While I plan on putting together a nice sinister for my ret pally this week, I haven't tackled that yet. As I was sorting through my character screenshots this morning to work on that post, I crossed some pics of transmoggers from my Deathwing server. Sets that stood out to me and made pause long enough to get a screenie and send them a tell. "Awesome xmog!" I thought I'd just take a moment today and post some of those. I saw a fun green set put together by Chocothundaa. 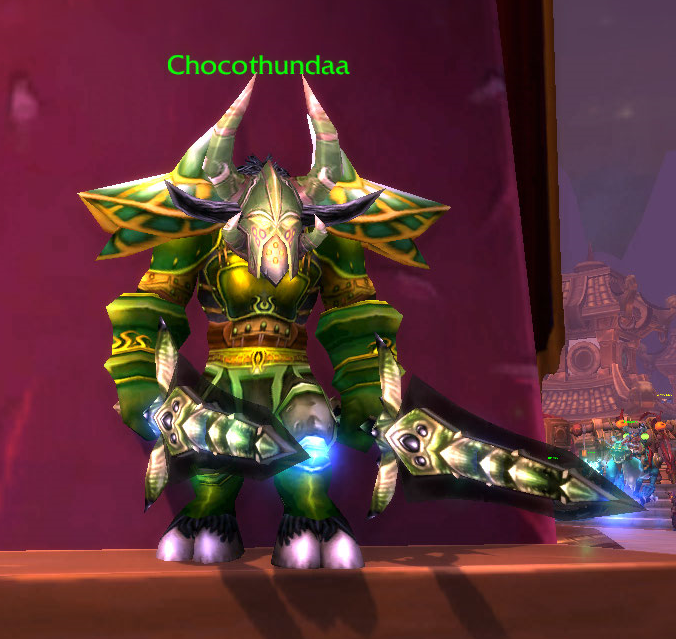 He didn't utilize the full emerald set, instead he switched in some fel iron pieces and came out with a fairly fun unique look. He was of course wearing a new pair of pink boots that had just dropped. I made him run to the bank and xmog to the green. Love the AQ swords dude. I ran across Uuku on my way to hit the engineering auctioneer in Twin Moons. No armory link. This character has been moved, renamed, deleted, who knows. She was using the Robes of Transcendence but no the full priest set. I couldn't recall what set the shoulders were from so I had to check WoW Roleplay Gear real quick. The shoulders are also priest only from the Vestments of Faith set. Ok, here's a Kaylena set and another Kaylena set! 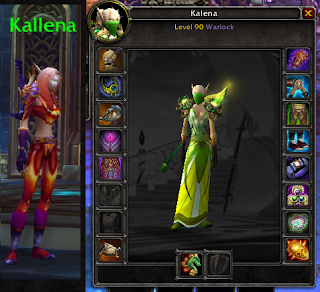 Take a sec to check out her transmog album if you need some more inspiration. Her hunter (the purple and gold pic) is sporting the Netherstorm Greaves. Awesome pinky, purply mail boots and very hard to match! There is a whole netherstorm set, but the graphic and the colors are totally different. I love her rainbowy look. And Venomshroud Robes ftw! I love her use of green here. Yes, Kaylena, is awesome. Gotta love the Vanilla plate sets! Tatiana does! I scored a screenshot of her near the beginning of the MoP when I was sporting my Jade set. Sistahs! Ok, that was cheesy but still kinda cool to see someone else in the same set with their own personal touches. And then ran into her later in the Glorious set. She tossed in some pieces from the paladin tiers 6 and 7. Go Gygan. Don't know if many recall but Gygan was one of the winners at the Deathwing WoW Factor competition last year. This set that I recently screenied is based on the Shattrath Protector chest piece and uses some different pieces of the paladin tier look alikes. I love it. It's definately not a set you see everyday. 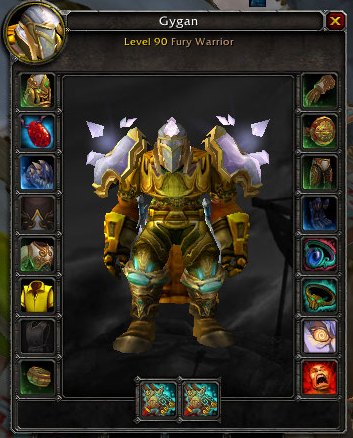 I'm also partial to Gygan because he's been playing since Vanilla and he's a blacksmith. Can we say long lost plate patterns anyone?! He's made some unique pieces for me before so he's one of my preferred crafters. And my favorite Wish. Absolutely b!tch*n set. Seriously. 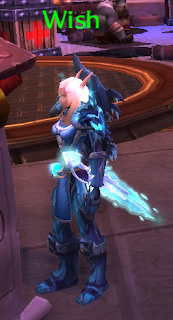 I know it's not hard to go get paladin tier pieces, but what really puts this set together is her selection of color. The icey blue of Hailstorm, the Lightbringer tabard, the Lost Pavise of the Blue Flight. It's hard to tell from this screenshot but she used Bubbling Anima Belt or something with the same graphic. I wasn't a fan of the glowy globe belts but this really goes very well with this set. And of course Heaving Plates of Protection. Absolutely stunning. I love it. That is some Deathwing server transmogging fun! And hopefully a nice little taste of tranmogrifying goodness to inspire you for a new set for the Siege of Orgrimmar. Seriously. We get to go kill Garrosh. This is indeed a momentous time in World of Warcraft. Special occasions call for special outfits don't you think? Should I be a glowing gold avenging angel or go with a sinister and intimidating look? What about glorious, bloody red? For the Horde! Or is that too conflicting to wear red while killing a former faction leader? Maybe I should I trick myself out as a Stormwind guard since I'll be tanking next patch. Irony ftw! But yes, definately time for a new set! What will YOU be wearing when it's time to down Garrosh?